Is it possible to have an electronic (scanned) copy of BLGF Memo Circular Nos. 01-M(29)-05 and 01-M(15)-08? I am doing some research on this. Unfortunately these are not available online and I have problems getting responses from the BLGF itself. We have uploaded the memo here in our website so you can download it from the link below. 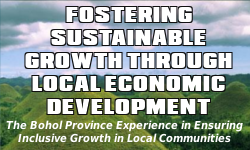 We hope you’ll find it very useful for your purpose, for the development of Bohol and the betterment of the Boholano people. hi good day! I am doing a research about these. And I need the latest year of classification especially in cities. It will help me a lot thanks!.